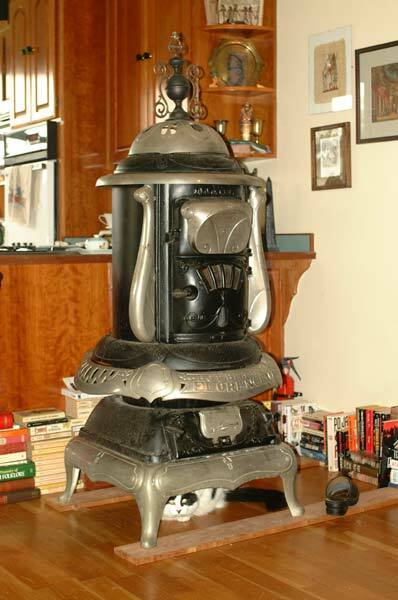 Lori and I drove out to Cottonwood to pick up this 1917 Florence parlor stove. Cottonwood is just south of Redding, so it was a 3.5 hour drive each way. 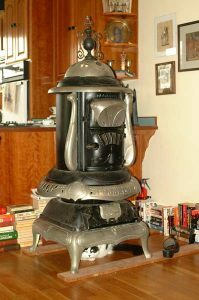 We weren’t sure if we were even going to be able to load the stove ourselves, as the people who were selling it were old and weren’t going to be able to offer much assistance. Fortunately it comes apart quite a bit and we were able to lift the heaviest piece. This stove will eventually replace the old wood cookstove that is in the kitchen area. This will allow us better heat the house using wood, as the cookstove has a really small firebox. Right now our house looks sort of like a fireplace/stove showroom. We have the new gas fireplace in the parlor, the old wood fireplace is on a dolly on the porch (and for sale), the old cookstove (also for sale), the new parlor stove, and the little parlor stove that we bought for upstairs when that is done.